Elba Township is located in the southwest portion of Lapeer County, Michigan.. Established in 1838, this small community of 5500 residents thrives on the peaceful living environment and rich heritage. Elba offers pristine lakes and beautiful rolling farmlands. Elba is a convenient commute to nearly any location, using the I-69 highway, which travels through the center of the Township. Elba Township Hall is located at the corner of Hadley & Lippincott Roads. The Supervisor, Clerk, Treasurer and Assessor’s offices are here to help you with any questions that you may have. The township offices are located at 4717 Lippincott Rd., Lapeer, MI 48446, and the phone number is 810-664-2332. ELBA TOWNSHIP MEMORIAL PARK CONSTRUCTION BEGINNING THIS SUMMER! 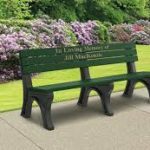 Elba Township Memorial Park engraved benches available for purchase. Engrave with business name, in memory of a loved one, or family name. Contact the Elba Township Clerk’s office for more information (810) 664-2332. Please contact Mike Boskee, Township Supervisor if interested. All tax payments for the year 2018 will be accepted in the office no later than Thursday, February 28th (interest has already been applied to any parcels still due, so please call for new amount owed). The Treasurer’s office will be open until 5 p.m. on Thursday the 28th in order to take your tax payments. If you have any questions please contact the Treasurer’s office. The Treasurer’s office will be open until 5 p.m. on Thursday the 28th in order to take your tax payments. Any payments left in the drop-box after 5 p.m. on Thursday or received via postal carrier (post mark is not accepted) will be transferred to the Lapeer County Treasurer for payment and will be subject to a late payment penalty. You can also make payments online until 5 p.m. on the 28th as well. Summer tax bills will be mailed out on July 1st 2019. Effective January 1, 2016, there was an increase in your quarterly sewer bill. This increase will cover the actual cost of operations and maintenance. Your bill increased from $94.00 to $130.00 per quarter. Any questions, please call 810-664-2332. Potter’s Lake Sewer User fee for Phase 2 is finalized. Bills will be mailed beginning December 1, 2017. If you have any question’s please contact Supervisor Mike Boskee. We are currently hiring Election Workers! Read a special Thank You to Chief Burke from an Elba Township Resident.